Sober Look: Equity futures are not "up on Alcoa"
Equity futures are not "up on Alcoa"
The box below is not a Google ad - it's a news headline from CNBC. According to CNBC, the market is up on Alcoa. Alcoa announced results after the close last night and had a call shortly after. The stock was actually down a bit. The futures did not start the rally until later in the evening. So how is it that Alcoa is driving the market higher? Is it because people can't read Alcoa's earnings report quickly enough? Well if you are slightly more seasoned than a 25 year old reported for CNBC, you would know that US markets have been driven largely by macroeconomic news lately. And the news last not was from China. The Chinese import growth has slowed, though continues to be robust. Again to a 25 year old reporter this does not make sense - an import slowdown is a reduction in economic activity. And how could that explain a rally in US equity futures of over 1% before the open? In fact this is exactly the type of macroeconomic news the markets love. China's imports are not falling off the cliff. The slowdown is visible enough to get the Chinese authorities to pay attention but not drastic enough to derail US growth. 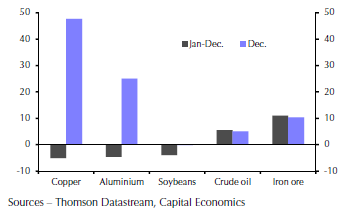 In fact Chana's imports of commodities - particularly copper and aluminum - were decent in December. Alcoa is in fact up on this China news but is not in itself the driver of US equity futures. The news that import growth is slowing down in China means that inflation will be easier to control and China's authorities will have room to accelerate monetary stimulus. China will absolutely need to do this to maintain growth and avoid social unrest. And that is what's really moving futures higher. As discussed earlier, the same holds true for China's slowdown in real estate markets.